With a cloth tape measure, measure around the middle of the dog's neck while the dog is standing. Use this measurement and the sizing information on the website to select the correct size. 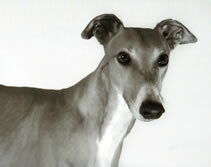 Width is generally a personal preference, smaller dogs like Italian Greyhounds and Whippets generally use a ¾" wide collar, while standard Greyhounds and larger dogs use a 1" or 1 ½" wide collar. A - This is the slip loop with a metal D-ring. It does not adjust. This is where tags and the leash are connected. B & C - These are the Tri-Guides. They allow the loop (A) to tighten. D - Adjust this Tri-Guide to change the collar size. 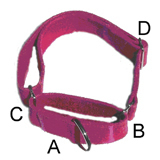 Collars are shipped at the smallest size. To increase the collar size, slide Tri-Guide D closer to Tri-Guide C.
Allow room to slip 2 fingers between the collar and the dog's neck.